So, your cat just peed on a nice piece of furniture, and you need to know how to get cat urine out of wood furniture. Coming from someone who has dealt with this same problem a number of times I know how you feel. It can be hard enough cleaning urine off a carpet, but cleaning wood furniture is a whole other problem. 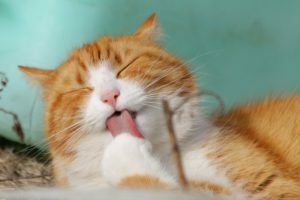 In the following article we will go over all of the cleaning options that are available, and the products that work best for cleaning cat urine off wood furniture. 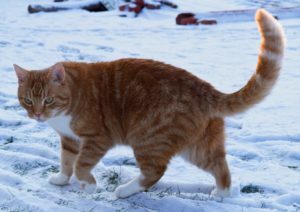 The first thing you need to do when your cat pees on wood furniture is to get ready to clean it up as soon as possible. The longer the urine sits on the furniture the harder time you will have getting it out. And if it dries out completely it can take a lot of work to get the stain and smell out completely. 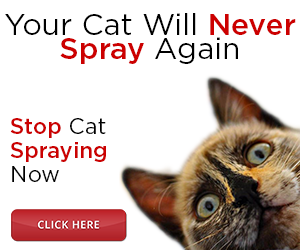 Are you a cat owner who couldn’t live without your feline friend, but your cat keeps “spraying” everything you own? 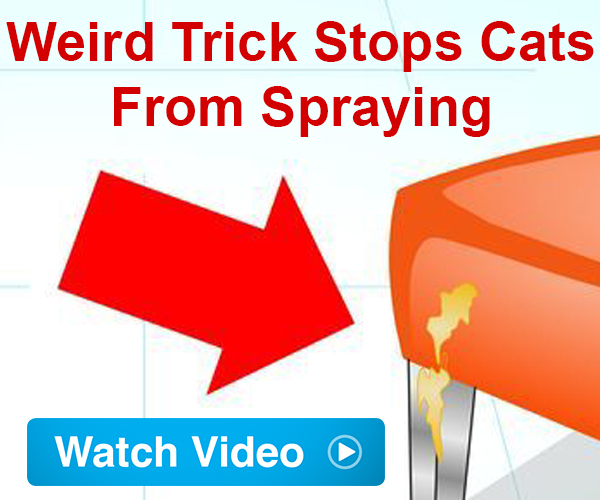 We have a proven system (Click Here to Find Out More) that will help you understand why your cat is doing what it’s doing, and how you can finally get their “spraying” under control. One of the easiest ways to get cat urine out of wood furniture is to buy an off the shelf product. These products work very quickly and don’t require a lot of effort and preparation. You will also have a wide selection of products to choose from that work on different materials and surfaces. 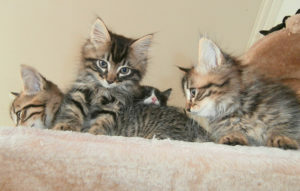 Most of the commercial cat urine removal products use natural non-toxic chemicals to treat the cat urine. The most popular are enzymatic cleaners for cat urine, which break down the urine by catalyzing a chemical reaction that destroys the parts of cat urine that are responsible for offensive odors. Other popular brands use oxygen-based compounds to lighten stains and break down odor causing elements. 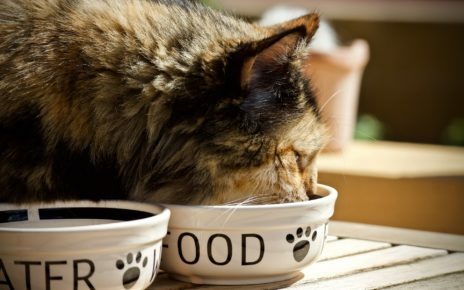 While other products use beneficial bacteria to digest organic molecules that are found in cat urine, so bad bacteria don’t get a chance to feed on them and cause a stink. Choosing which product is right for your situation will depend on how bad the cat urine stain is on your furniture. If it can just be wiped off a smooth surface, and it hasn’t soaked in too deeply then you can go with a less aggressive product. If on the other hand, you have cat urine soaked deep into your wood furniture multiple cleanings with an enzyme or bacterial based product might be necessary. 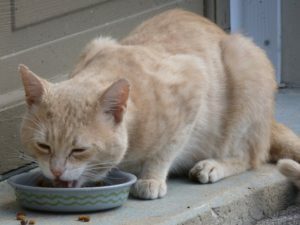 Household items like baking soda and vinegar can come in handy if you need to deal with cat urine and you don’t have a commercial product on hand. All you will have to do is mix up a paste of baking soda and white vinegar and rub it gently into the urine stain. As long as the urine is still fresh the vinegar and baking soda will start neutralizing the cat urine on contact. Keep gently rubbing the surface until all traces of the urine have been removed. 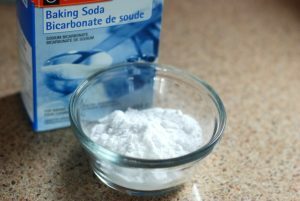 Then clean off any residue of baking soda and vinegar that is left behind with a damp cloth. If you have an old dried up stain vinegar and baking soda will be less effective. If you have to treat an old discolored stain you can try using hydrogen peroxide. You should be careful with this method though because it can lead to discoloration if it is left to sit on the wood for too long. To treat a dark stain with hydrogen peroxide simply soak a washcloth with a 3% solution of drugstore peroxide. Then lay the wet cloth on the stain and let it sit for a few hours or overnight if needed. Be sure to check on the spot from time to time to make sure the peroxide is not lightening the wood too much. Once the stain has dissipated you can remove the cloth and let the spot air dry. 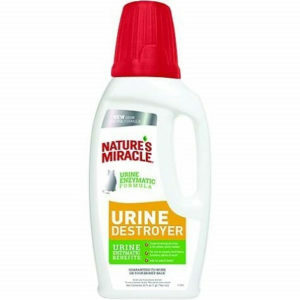 Nature’s Miracle Just for Cats Urine Destroyer (Buy Online) is one of the most well-known cat urine clean up formulas on the market. 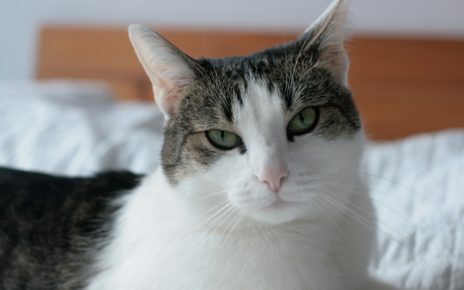 You can use Nature’s Miracle Just for Cats on carpet, tile, linoleum and most importantly wood. Nature’s Miracle Just for Cats can be used on any wood furniture as long as it has been treated with a sealant or varnish. The main ingredients found in Nature’s Miracle Just for Cats Urine Destroyer are water, enzymes, surfactants, alcohol and odor neutralizers and fragrances. Whenever I need an enzymatic cleaner for cat urine Nature’s Miracle products are always my number one choice. They work just as well whether I have to clean hardwood furniture or floors. The enzymes also help break down any urine that gets deep into the crevices commonly found on wood furniture, so I can be sure all the urine is gone and the cat urine smell won’t come back. 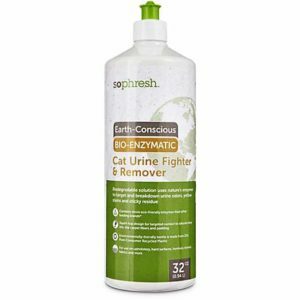 So Phresh Earth-Conscious Bio-Enzymatic Cat Urine Fighter & Remover (Buy Online) is a very powerful enzymatic cleaner for cat urine. This product contains more urine destroying enzymes than most other products on the market. If you have tried other enzyme-based products but the results have been unsatisfactory then you might want to give this one a shot. The problem might have been that the other products you tried didn’t have a high enough concentration of enzymes to get the job done. Many people have reported that they have used other popular brands of cat urine remover and they just didn’t work out for them. And then when the used So Phresh Earth-Conscious Bio-Enzymatic Cat Urine Fighter & Remover it cleaned up the urine and the smell right away. Nature’s Miracle Orange-Oxy Power Just for Cats Stain & Odor Remover (Buy Online) is a powerful cat urine remover with a fresh orange scent. This formula is perfect for removing cat urine from furniture since it uses all natural ingredients that won’t damage your furniture’s finish. 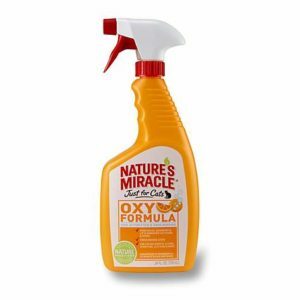 The main ingredients in Nature’s Miracle Orange-Oxy Power Just for Cats Stain & Odor Remover are water, oxygen concentrate, orange extract, and fragrances. The oxygen concentrate helps break down the cat urine. While the orange extract and fragrances help cover up the scent. The orange extract also has the added benefit of being good for wood surfaces. Orange oils are commonly used in wood polish to help bring out the woods natural luster and shine. And since this formula doesn’t use any alcohol it won’t dry out your furniture when you use it. The orange oils will also help protect your furniture as you clean it by replenishing the woods moisture barrier. 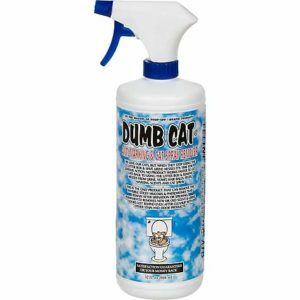 Dumb Cat Anti-Marking & Cat Spray Remover (Buy Online) is great for cleaning cat urine and for discouraging your cat from marking your furniture in the future. As the old saying goes an ounce of prevention is worth a pound of cure, and that’s what you get when you use Dumb Cat Anti-Marking & Cat Spray Remover. Cleaning is only one half of the battle when it comes to protecting your wood furniture from the damage caused by cat urine. The other half is modifying your cat’s behavior so it doesn’t happen again. That’s where Dumb Cat Anti-Marking & Cat Spray Remover comes in, with its unique formula that actually addresses the main reasons why your cat marks the same spot over and over again. Just like most powerful urine removers, this one uses enzymes to break down urine, so you will get the same cleaning power as other popular brands. 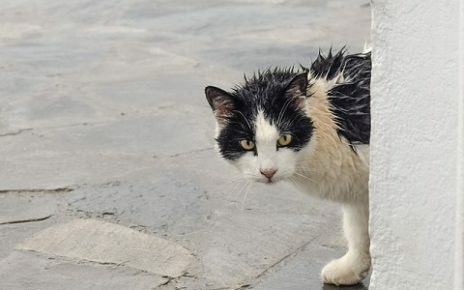 Where Dumb Cat Anti-Marking & Cat Spray Remover really stands out is that it contains beneficial bacteria that digest the chemicals in cat urine. These bacteria help break down organic molecules like pheromones so your cat isn’t attracted by their smell to spray that same place. And the bacteria continue working longer than enzymes since enzymes lose effectiveness as they break down waste. 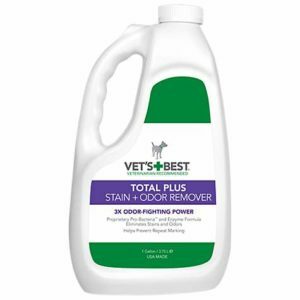 Vet’s Best Total Plus Pet Stain & Odor Remover (Buy Online) is another great product for removing cat urine from furniture. This cat urine remover uses a blend of enzymes and bacteria to treat hard to remove smells and stains. This cat urine removal product will get the smell of cat urine out of wood furniture even if it is a deeply soaked in stain. The strong enzymes begin breaking down the urine on contact which will reduce most of the odor and lighten the stain. Then the beneficial bacteria will go to work digesting the organic compounds that lead to odor. The beneficial bacteria will also continue working as long as the area you have treated is still damp. The bacteria will keep feeding and multiplying until they have consumed all the urine or until they dry out. This continuous bacterial break down compliments the enzymes perfectly since the enzymes lose their effectiveness once they have cycled through a few reactions. 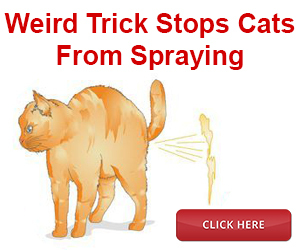 Simple Solution Urine Destroyer (Buy Online) is perfect if you have cats that like to spray all over the place. If you have cats that like to mark the furniture as well as the carpet, drapes, appliances etc then this handy spray bottle is what you most likely need. If you have ever said to yourself my cat pees on everything then you know how challenging it can be to clean all those surfaces especially in hard to reach places. 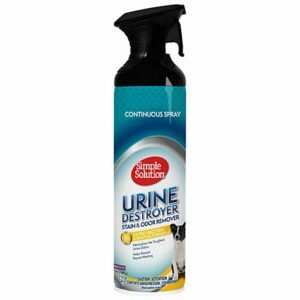 The Simple Solution Urine Destroyer comes in a convenient pressurized spray bottle. The continuous spray will work when the bottle is held at awkward angles, and it won’t wear out your hand muscles if you have a big urine spot to spray. The Simple Solution Urine Destroyer uses a blend of enzymes and bacteria to help break down urine in two different ways. 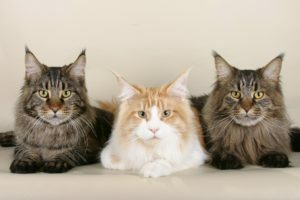 First, the enzymes will immediately start breaking down the cat urine, then the bacteria will continue working on removing any urine odors and stains that remain. This combination of active ingredients is one of the most effective ways of completely removing cat urine from wood furniture or any other type of surface. 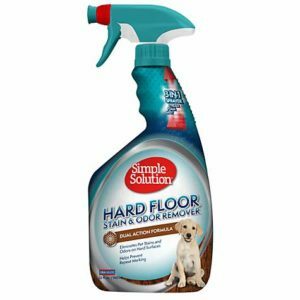 Simple Solution Hardfloor Pet Stain & Odor Remover (Buy Online) is specifically made for use on hard surfaces like treated hardwood and furniture. This product can also be used on tile, concrete, linoleum or even brick and marble. 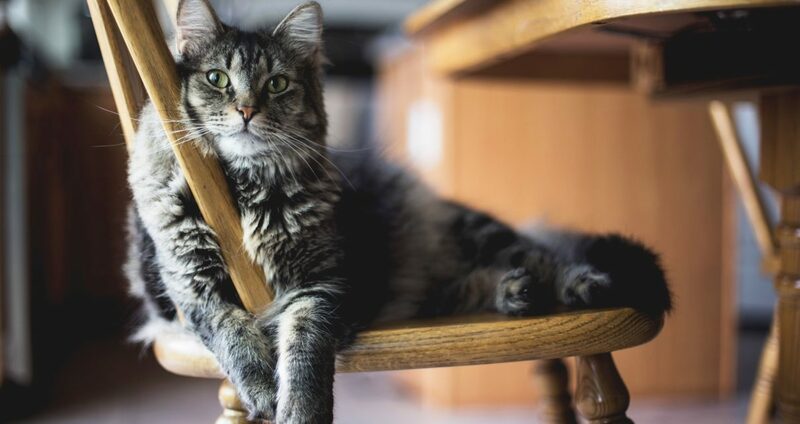 Simple Solution Hardfloor Pet Stain & Odor Remover works well if your cat sprays the legs of your wood chairs or any other smooth hard surfaces. Where this product might not work as well is on wood furniture that has intricate carvings or if cat urine gets into the joints. The reason for this is that this product doesn’t use enzymes to break down cat urine so it won’t as effectively treat those hard to reach places. If you only have a problem with cats spraying parts of your furniture that can be easily wiped off then this product will work as advertised. Simple Solution Hardfloor Pet Stain & Odor Remover will also serve double duty if you have other hard surfaces like wood or marble floors that get caught in your cats crossfire.